The ideal radiation treatment for cancer would deliver a lethal dose of radiation to the entire tumor while simultaneously minimizing radiation dose delivered to surrounding tissues. Technologic advances in imaging and radiation delivery have enabled relatively precise determination of the size and shape of the tumor and the delivery of a tightly focused dose of radiation to a volume of tissue that can be contoured to match the shape and size of a tumor. When this focused and contoured volume of irradiated tissue is coincident with the actual tumor target, then the ideal radiation treatment has been approximated. Fiducial markers act as visible surrogates of tumor location, and they can provide accurate localization and tracking of tumors, even when the tumor is difficult to see on fluoroscopy or CT scan. A wide variety of fiducials with an equally wide range of shapes, sizes, and surface treatments are currently available for use in the body. Some basic guidelines to follow when implanting fiducials include the following: 4–6 should be implanted to so that three remain in place, they should be placed in and around the tumor such that the bulk of the tumor is bracketed by the fiducials, those placed outside the tumor should be placed as close to the edge of the tumor as possible, and they should not be placed collinearly. 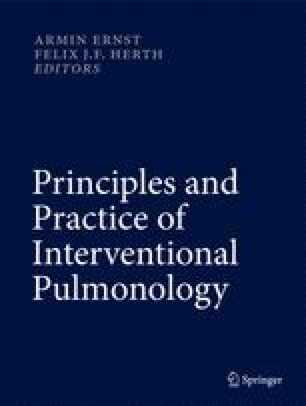 By selecting the appropriate fiducial, implantation in the lung and in accordance with these guidelines can be achieved transthoracically or bronchoscopically using a variety of imaging guidance techniques. Additionally, in the current indexed literature, 583 patients have had more than 1,004 fiducial markers placed percutaneously and 236 patients who had 658 fiducial markers placed bronchoscopically in or near lung tumors. With the exception of a relatively high (17 %) rate of pneumothorax requiring chest tube placement following transthoracic placement, fiducial placement appears quite safe with a low (0.5 %) rate of pneumothorax requiring a chest tube following bronchoscopic fiducial placement and no pneumonias related to the fiducials reported with either implantation technique. Unfortunately, this literature does not contain sufficient data to draw any conclusions about long-term survival following treatment when radiation therapy is provided with internal fiducials versus no fiducials or when fiducials are placed by bronchoscopy versus transthoracic needles.